Professor Sir Paul Curran, President of City, University of London, has been awarded Freedom of the City of London. One of the oldest surviving ceremonies in existence, Freedom of the City of London is believed to have been first presented in 1237. Sir Paul received his illuminated Freedom scroll (or ‘resolution’) at a ceremony at Guildhall on Tuesday 16th May. Alderman Dr Andrew Parmley, The Lord Mayor, said: "London is home to a wealth of world-leading universities, making the capital the primary destination for students from across the UK and abroad. Sir Paul’s leadership of City, University of London and his wider contribution to London’s Higher Education sector make him a very deserving recipient." 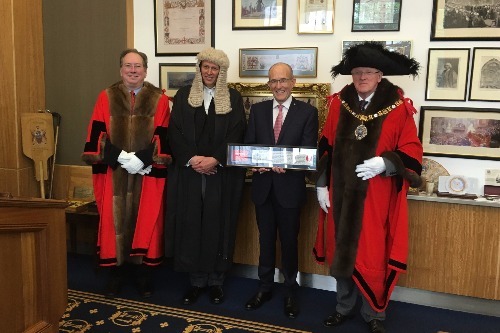 Commenting on the award, Professor Sir Paul Curran said: "I am honoured to receive the Freedom of the City of London and proud to serve City, University of London, which is the university of the City of London." The honour historically provided trading rights and privileges including the right to go about the City with a drawn sword.